Airport parking at the airport is quite straightforward. 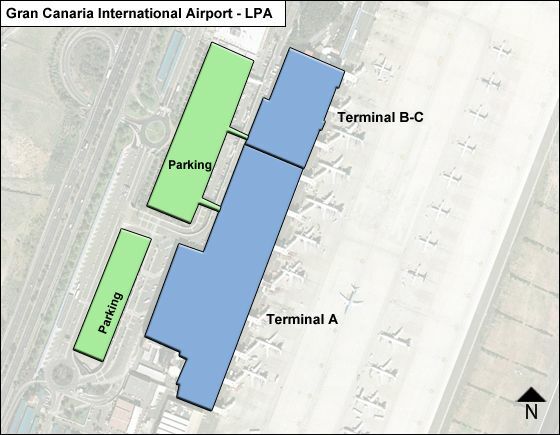 There are two official car parks at LPA Gran Canaria airport with a maximum capacity of 3,545 vehicles. There are 1,438 spaces, having 15 which are reserved for people with reduced mobility. The parking spaces are distributed over three floors: floor A (370 places), floor B (569 places) and floor C (499 places). It is located just next to the terminal and passengers can access to it by foot. A three-story car park with all of the parking bays covered provide ample airport parking. Entering the car park there is a barrier. A ticket is provided by the automated machine at the barrier. Take the ticket with you and pay before you return to your car. There are payment machines at all levels of the car park, which accept credit/debit cards and all Euro notes and coins, and they give change. There is also a manned payment desk in the car park control centre where payments can be made by credit card and any issues dealt with. Once you have paid you have twenty minutes to exit airport parking. For disabled drivers, there are convenient spaces for badge holders and there is access to all areas by ramps and/or lifts. It’s located 4-5 minutes walk from the terminal building with good pedestrian access. The building has two levels to park. Level 0 is covered and Level 1 is uncovered with parking bays. Travellers must validate the ticket in the manual booth in car park P1. You can easily access the airport from both the north and south bound carriageways of the GC-1 motorway. The parking areas are easy to locate. Follow the directions for the terminal and then the blue P1 signs for the short-term car park, or the yellow P2 signs for the long-term car park. For a car rental return, follow the key & car symbol and the logo of your rental company. There is a height restriction of 2.1 meters at the airport car park barriers. There is a drop-off zone at the entrance to the arrivals hall, allowing you to stop for a couple of minutes. Passengers will be asked to move on if they are there too long. When picking up passengers, you cannot leave your car unattended as it will be removed immediately. Therefore it is best to use the cheap short-stay airport car parking when collecting passengers.